Former independent MP Rob Oakeshott announced yesterday that he will be running for the federal seat of Cowper at this year’s election. In this post I will run through some of the dynamics of that electorate which will be critical to that contest. I’ll be using a lot of the work I have done on my guide to the seat of Cowper, which is worth a look. Rob Oakeshott represented the people of Port Macquarie in two parliaments for seventeen years, from 1996 until his retirement in 2013. He was first elected to parliament as a National at a 1996 by-election for the state seat of Port Macquarie, and re-elected in 1999. He resigned from the party in 2002, and he was re-elected as an independent twice, in 2003 and 2007, both times with a large majority of the primary vote. He shifted to the federal seat of Lyne in 2008, winning a by-election triggered by the retirement of former deputy prime minister and Nationals leader Mark Vaile. Fellow independent Peter Besseling won the state by-election, but lost his seat to the Nationals in 2011. Oakeshott won Lyne in 2008 by quite a safe margin, and retained the seat with a 12.7% margin in 2010. We know what happened next – Oakeshott, along with fellow rural independent Tony Windsor, supported the Gillard Labor government, triggering a storm of anger amongst rural conservatives. He chose not to run again in 2013. This brings us to the seat Oakeshott is hoping to represent. He isn’t running for Lyne, but rather Cowper. This was caused by the last New South Wales federal redistribution, when the map was redrawn before the 2016 election. The abolition of a seat in the Hunter region caused all of the seats on the north coast to shift south substantially. 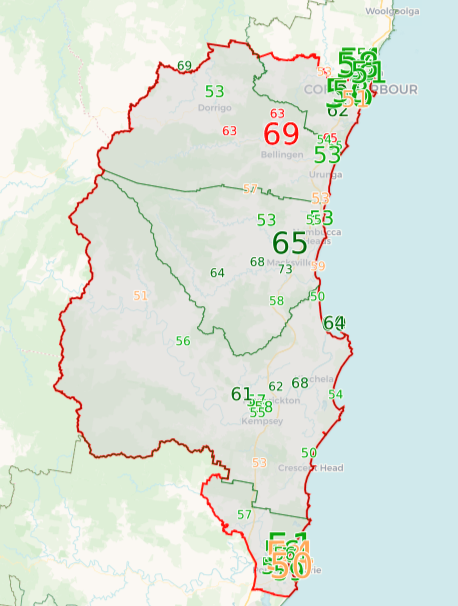 The seat of Cowper, which was previously centred on Coffs Harbour, shifted south to take in both Coffs and Port Macquarie, and not much else. Port Macquarie had previously been the main town in Lyne, but it shifted south to take in Forster, Tuncurry, Dungog and parts of Maitland from the seat of Paterson. The above map shows the 2016 booths of Cowper, with Coffs Harbour in gold and Port Macquarie in green. Coffs Harbour made up about 32% of the election-day vote in Cowper, while Port Macquarie makes up about 28%. With Oakeshott’s previous career focused on Port Macquarie, it’s not surprising he chose to shift his focus to Cowper when he decided on a last-minute run in 2016, announcing his candidacy one month before the election. Oakeshott managed 26% of the primary vote, and after preferences reduced the Nationals margin down to 4.6% for longstanding local MP Luke Hartsuyker. This next map shows the Nationals vs Oakeshott two-candidate-preferred count by booth at the 2016 election. The Nationals won most booths, but not by much. Oakeshott won 56% in Bellingen, and 47.4% in Port Macquarie. Hartsuyker was strongest in Kempsey, with 58.4%, while he achieved a relatively strong 55% in Coffs Harbour. Oakeshott will need to do better in 2016, but there’s plenty of reasons to think that is possible. Luke Hartsuyker’s retirement means Oakeshott is the biggest name in the race, and he’s given himself a few months to campaign this time. The Morrison government’s unpopularity can’t hurt Oakeshott’s chances. While there was undoubtedly some impact on his popularity when he supported the Labor government, his 2016 result suggests he still has a great deal of support in this area, and it seems entirely possible, in these circumstances, that he could find his way back into federal parliament. If you want to know more about this race, please check out my guide to the seat of Cowper, and feel free to leave a comment on that seat guide any time between now and the election. What are the odds that Tony Windsor also makes a comeback to take on Barnaby Joyce again in New England? He’d have to have a pretty good chance of taking him out considering how unpopular the Coalition and Nationals are right now. Then of course there’s the whole “bonkgate” affair which has crippled Joyce’s reputation, not that he had much of one to lose if you ask me. Tony Windsor is a bit older and not as well placed as Rob Oakeshott……but Barnaby is very much damaged goods…….. I suspect he won’t be the candidate……. he would need to get very close to an absolute majority to win……otherwise there will be a anyone but Barnaby campaign and the best placed of “any: would have an excellent chance to win………. at the least lots of resources would be put into the seat…….. he is now a liability to the nationals … he still wants to lead maybe he will get Matt’s vote!
. Oakshott has been a target of unremitting obscenity laden tirades. Whilst I don’t always agree with Ben Raue’s adjudication Facebook’s unadjudicated site gives the uninformed and over-opinionated an opportunity to show what unrestrained rant can develop into. Ben I will cop what I think is an occasional wrong call from Referee for civility in play. assume Oakeshot will stand in what ever seat includes Port Macquarie….. as putting port and Coffs in the seat is a bad idea then what happens when the next redistribution puts port back in Lyne?